What’s a vanity name? The simple version is it’s a Subdomain or URL on a third party service you can freely create, which includes your Name, Company, Brand Name or even your Keywords in the URL. Creating keyword rich account names, blogs and subdomains on these authoritative high traffic domains is great for rankings, reputation management, obtaining backlinks and branding for your site or company. The ScrapeBox Vanity Name Checker is a free addon included with ScrapeBox that allows you to check your Name, Brand Name or Keywords to see if accounts by these names are available for registration on popular Web 2.0 and Blogging sites. But that’s not all, it can also be used by loading urls which you have harvested to check if any of these accounts with high PageRank have been abandoned or deleted and are available for registration again. You can either type keywords, or load a list of URL’s belonging to any of the supported platforms in order to check if the accounts are available. The addon also allows you to export all Available, or Unavailable as .txt as well as the status of all as xls/csv formats. This addon also multi-threaded for fast bulk lookups, and supports proxies which are rotated on every request to avoid being blocked! 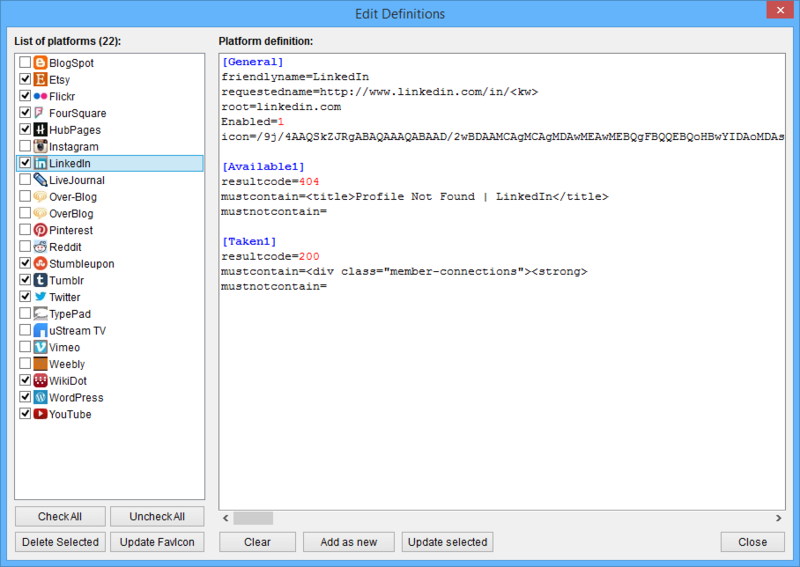 Trainable platforms allows you to have complete control over what sites and platforms the Vanity Checker can work with. 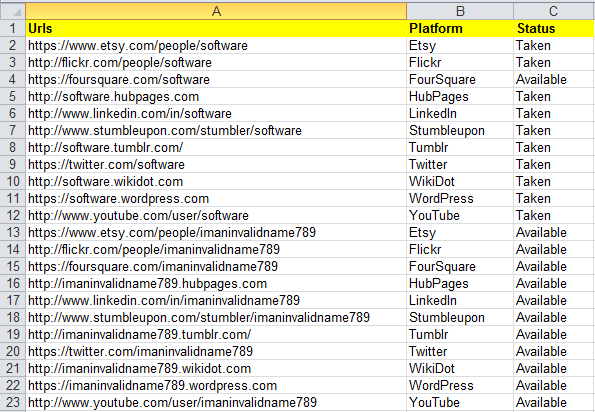 You are free to add your own new platforms that are not yet supported, or make modifications to the includes sites. Setting it up is fairly simple, you just need to identify a unique piece of text or HTML on the page of a profile that’s already been taken and registered and the same for a profile available to register. Export the Vanity Checkers results to an .xlsx file so you can easily manage your various Web 2.0 profiles and brand names. 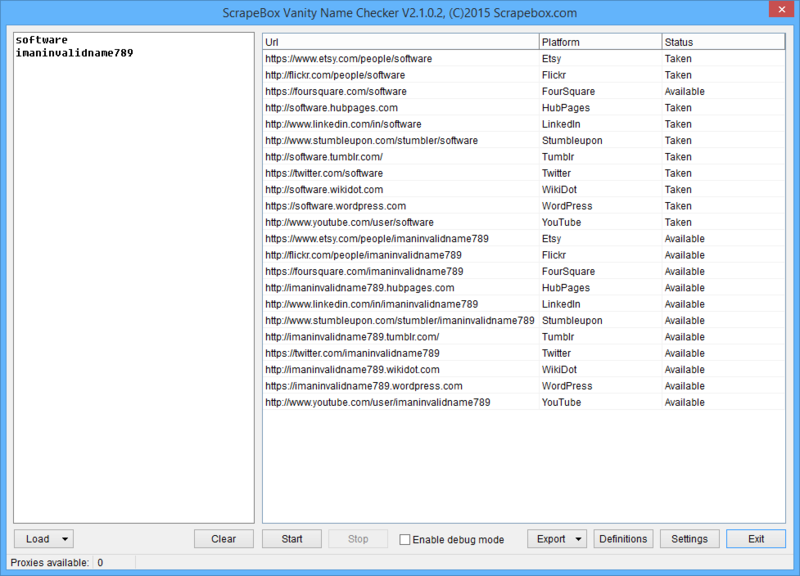 The Vanity Checker also allows you to export the Available names and not Available names to a plain text file so you can checkout the profiles in your browser or run other checks such as the ScrapeBox Google Index Checker, the Page Authority checker or the Social Checker to see how many other social metrics your profiles have gained. View our video tutorial showing the Vanity Checker in action. 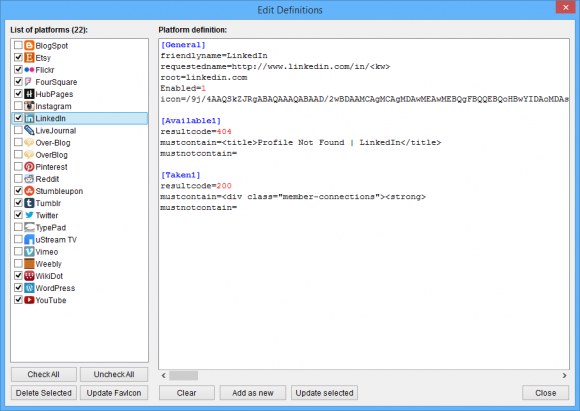 This is a free addon included with ScrapeBox, and is also compatible with our Automator Plugin.